Anne Austin's family has lived in Long Valley since the first settlers came there in 1883, and of all the things I can tell you about a day at Eleven Roses Ranch, that fact is most important. It's rare enough to find a native Californian in a state teeming with transplants, and it's even more unusual to find a family that's been in the same place for generations. Those deep roots foster the passion Austin displays for her home, the most interesting thing you'll encounter in a day full of charms. Eleven Roses Ranch lies in an unspoiled hillside valley, a beautiful property with native trees and flowers galore, and enough wild animals to fill a small zoo: turkeys, elk, bears, deer and plenty more. You may see some of them during your tour. The Eleven Roses Ranch day tour is one of the most relaxing things we've done in a long time. On arrival, you'll be greeted like an old friend, offered local wines and a snack. While Austin gives a short overview of the ranch's history, her husband James gets their two mules ready to go. Once Belle and Blue are hitched to a specially-made wagon, visitors climb aboard for a wagon ride through the hills and a short walk to a point with a view of the valley. In spring, wildflowers carpet the valley and naturalized iris bloom profusely around an old homestead. Anytime, you'll enjoy Austin's lively commentary. Back at the ranch, you'll enjoy a barbecue lunch, and you may find yourself trying to figure out how to stretch your stay just a little longer when it's time to go. We don't want to ruin all the surprises, so we'll let the Austins tell you how the ranch got its name. And all we'll say about the porta-potties is that more than one person wanted to have their picture taken in them. Bring your camera, or you'll regret it. Binoculars are helpful for getting a better look at some of the wildlife. The barbecued beef lunch is excellent, but if you don't eat red meat, ask for an alternative when making your reservation. Wear layers. What may start off as a cool morning, can become hot by lunch time. Don't forget the sunscreen and hat. While you may get caught up staring at the beautiful landscape or horses around you, the sun can take a toll on your skin. Even the surliest teenagers seem to enjoy Eleven Roses Ranch. 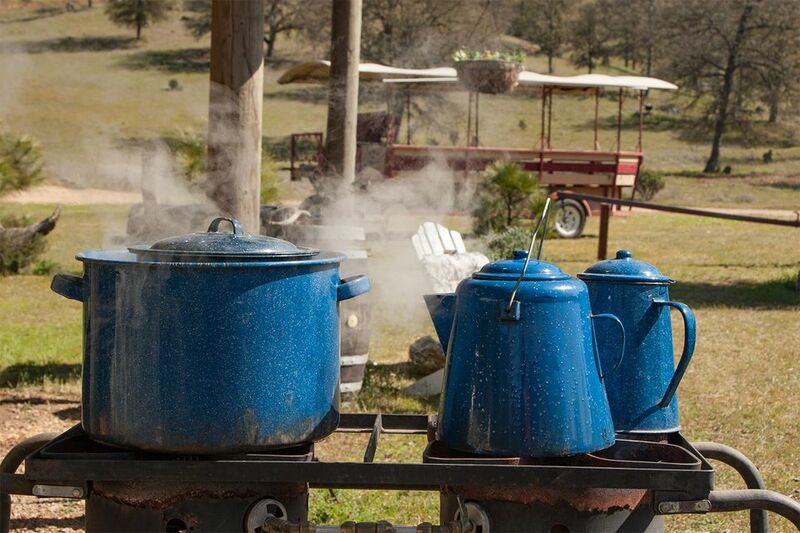 We rate Eleven Roses Ranch 5 stars out of 5 for beautiful surroundings and an excellent barbecue meal, but most of all for the passion Anne Austin exhibits for the land and her deep connection with it, which she shares generously with her guests. The tour cost includes wine and other beverages, a meal and a wagon tour, making it a good value for your money. Tours are given April through October, weekends and weekdays. With enough demand and weather permitting, the season may last a little longer. Reservations are required. Tours are limited to 20 people per tour. Fees charged include tour, lunch, and beverages. For ticket prices check their website. Tours last about four hours. The best time to visit is when the Wildflowers peak in spring, but any time is just as fun. Eleven Roses Ranch is about 11 miles off California Hwy 20 on the west side of Clear Lake. You will get detailed directions when you make your reservation. As is common in the travel industry, the writer was provided with a complimentary tour for the purpose of reviewing Eleven Roses Ranch. While it has not influenced this review, About.com believes in full disclosure of all potential conflicts of interest.